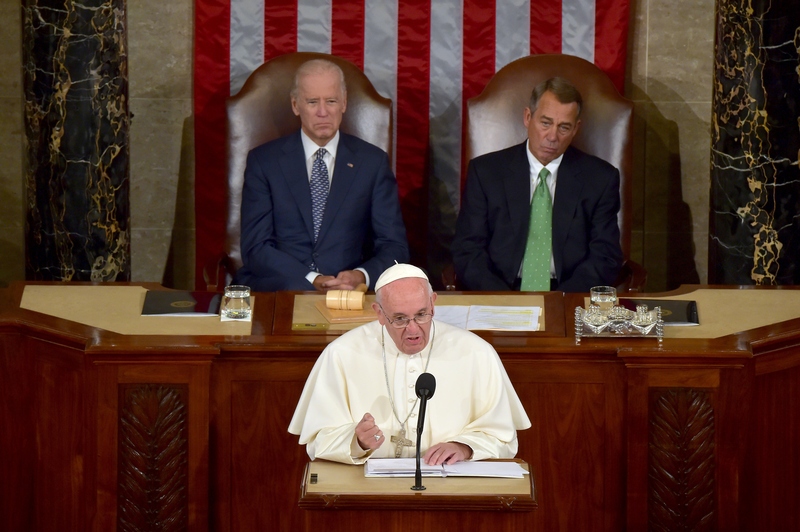 Pope Francis became the first pope to ever deliver a speech to Congress Thursday morning, during which he called on the U.S. to step up technological developments that could address climate change, and also reinforced his position against abortion and the death penalty. The speech, which was relatively moderate on a partisan spectrum, was pretty inspirational, especially when it came to issues like tolerance and poverty reduction. All of Francis' positions were extremely balanced, which will probably appeal more to Democrats than Republicans. For example, he said that he believes that life should be protected at all stages of development, but moments later said that means the U.S. should abolish the death penalty. When he discussed religious freedom, he said that it's extremely important to make sure that religion is not used as an excuse for discrimination or violence. When Pope Francis addressed poverty, he said that lawmakers need to take into account one of the root causes of poverty: income inequality and poor wealth distribution. For Republicans, this issue isn't something that's easy to talk about, given the fact that their economic plans often favor cutting benefits for poor families and reducing taxes for the rich as a way to help their companies "grow." In an effort to hammer home this point, Francis will later have lunch with some of D.C.'s homeless. Overall, Francis didn't seem to ardently condemn either Republicans' or Democrats' for their goals in office, as long as they were being balanced and inclusive. Read a full transcript of the long speech below, via the Charlotte Observer.